Hold on to your hats! From the Kate Greenaway-winning creator of I Want My Hat Back and This Is Not My Hat comes the much-anticipated conclusion to the celebrated hat trilogy. Two turtles have found a hat. The hat looks good on both of them. But there are two turtles. And there is only one hat... 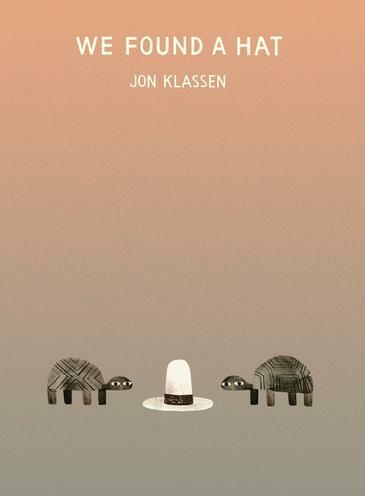 Evoking hilarity and sympathy, the shifting eyes tell the tale in this perfectly paced story in three parts, highlighting Jon Klassen's visual comedy, deceptive simplicity and deliciously deadpan humour. This is the third in Klassen’s series of Hat books. I have previously reviewed This is Not My Hat You can see a trailer about I Want my Hat Back here. From the front cover, we know that tension will come. There’s a gradient of soft brown to grey and highlighted against it, we spy two patterned turtles gazing at us, and between them a ten gallon type hat that each turtle is equidistant from. What do you do when there are two of you and only one hat? It’s a problem any child will understand completely. There’s a delightfully enigmatic resolution, too. I love the use of eyes to prompt readers' thoughts as we infer just what is going on in the turtle’s head. I also love the detail in the artwork. The limited palette used by Klassen really sets off the night time and desert scenes beautifully. Conversely, I love the lack of detail in the text! Somehow Klaassen knows when to leave words out and leave it up to his readers to work out a character’s thoughts. Quite simply, kids will love to read, share and listen to We Found a Hat!